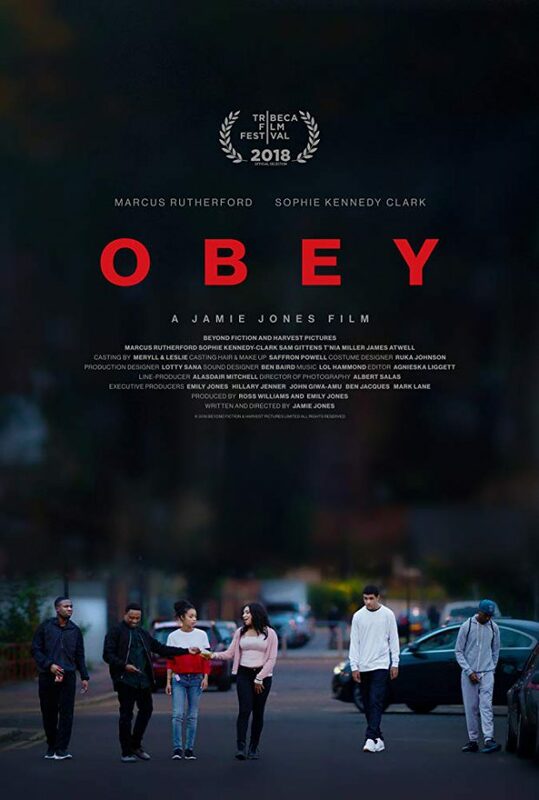 A young man has to deal wiith family issues and widespread social unrest against the backdrop of the 2011 London riots in Jamie Jones’ Obey. The 2011 London riots is a significant event that will be relatively fresh in the minds of a lot of people given the widespread consequences of those events that resonate to this day. Telling a story set during the riots was inevitable though there are questions around what the right approach is. Obey has the riots as a backdrop to Leon’s (Marcus Rutherford) story. It’s an approach that both works and doesn’t. What works about it is that a contextual hook is created that helps flesh out Leon’s world as something real, familiar and filled with tension while also allowing for the exploration of a nigh on forgotten section of society that receives little in the way of media attention, even less in a positive light. The drawback in this case is that the riots themselves feel somewhat incidental to the story being told. Leon’s story could have taken place against the backdrop of a Zombie Apocalypse and had a similar impact outside of some key scenes where the riots and social unrest become more significant. On the whole I think this approach is the right one because it avoids the problem of potentially taking sides in a contentious conflict that has a variation of opinions on both sides. Instead the audience gets snapshots of those involved on both sides and are allowed to see different points of view. The film depicts the plight of the people who feel victimised and forgotten while also showing the perspective of the terrified police tasked with keeping the peace and given orders from people far away from the reality of the situation. I was impressed by the range of content in the background. In some scenes the police are demonised with a strong undercurrent of racial tension fuelling their actions and in others we are shown how dangerous mob mentality can be when angry people feel like they have right on their side simply because their numbers are strong enough to be a threat. Most of the angles within these are explored such as being caught up in the romance of breaking the law shown by looting and police abusing their authority simply to inflict violence on innocent people. It’s an ugly conflict with plenty of blame to throw around and the film isn’t shy about putting that forward. It’s perhaps for the best that Leon spends the bulk of the film outside of this conflict as it shows his strength of character, moral code and allows the audience to invest in him. His home life is explored extensively with his alcohol dependent mother, Chelsea (T’Nia Miller) and her abusive boyfriend, Chris (James Atwell) making home an uncomfortable place for him to be. His desire to escape becomes the audience’s desire to escape with plenty of strong work done to establish Leon as someone who has a good head on his shoulders and is in dire need of hope in his life. Things look up when he meets Twiggy (Sophie Kennedy Clark); a young woman who shows him the right amount of compassion while challenging him to take steps to improve his situation. The script deftly avoids the “Manic Pixie Dream Girl” trope by characterising Twiggy as having her own ambitions, vulnerabilities and arc independent of Leon. Sophie Kennedy Clark’s performance is excellent as well though I really wanted to see more of Twiggy as she would have been interesting enough to carry her own film based on the glimpses of her backstory and other problems that she routinely faces. It’s perhaps more effective that we see her through the eyes of Leon as she becomes a mystery that he -and by extension the audience- is eager to solve. Their interactions are fascinating to watch and the growth of their connection feels organic. Leon is a really interesting character who grows throughout the film in his own right. He is very much a product of his environment even though that frustrates him and has to find his own way to navigate that. The backdrop of social unrest can’t help but be infectious as his situation grows even more desperate with the threat of the riots steadily closing in on him. Despite his situation he remains personable, rational and well rounded. Marcus Rutherford’s performance is engaging and confident, carrying the film wonderfully while bouncing off the other actors nicely. With this being a character driven story the narrative progresses as Leon does and the tension comes from his own personal issues. The main things to note is his concern for his mother and her ability to function, trying to get close to Twiggy and trying to stay out of the brewing conflict that all of his friends are drawn to. The film frames him as the middle ground in this conflict because he is able to see both sides of it until the climax forces him to make a choice one way or another. As moments go it was fairly heavy handed though it doesn’t detract from the strong work done prior to this. An excellent character study with a strong supporting cast and impressive backdrop. Leon is an engaging character because of his well developed background giving him clear challenges to overcome. Marcus Rutherford delivers a strong and confident performance which helps bring Leon to life. His relationship with Twiggy is equally well handled because she is an engaging character in her own right excellently performed by Sophie Kennedy Clark. The backdrop of the London riots both works and doesn’t though paints the picture of social unrest and complex motivations really well. Obey loses something in its heavy handed ending but it doesn’t detract with the strong work done prior to this.